Welcome to readers both current and future! This site serves as a companion to the book Eric Meyer on CSS , now available from New Riders Publishing. Here you will find the project files to accompany each of the 13 projects in the book, useful links, some bonus materials cut from the printed book because of length, and more. If you don't own the book yet, you can certainly look at any of these materials, as well as read about the book and its author, sample some praise for the book and links to full reviews, and find out where to order a copy of your own. If you can read this note, then you're using a browser that doesn't support CSS, or doesn't support it very well. The contents of the site should be readable, if not very pretty. The book this site promotes takes a similar approach, as explained on the Order a copy! page, so that's worth reading if you're concerned by what you see. 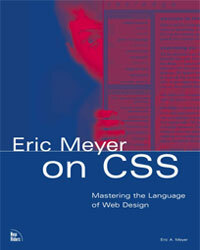 More Eric Meyer on CSS , the follow-up to this title, is now available! The new book features ten all-new projects while keeping the same approach and tone of Eric Meyer on CSS . Among the new book's projects are looks at converting a design from tables to tableless, CSS-driven dropdown menus, and the creation of a CSS Zen Garden design. If you liked Eric Meyer on CSS but wished there were More , then the new book is definitely for you. Just skip on over to more.ericmeyeroncss.com to learn all about it! Unless otherwise indicated, all contents of this site and the book Eric Meyer on CSS: Mastering the Language of Web Design are copyright Eric A. Meyer and New Riders Publishing. All Rights Reserved.